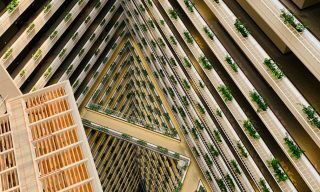 A stalwart of Jakarta’s hospitality scene, the Four Seasons has recently reopened in a 20-story tower at Capital Place, offering an intimate all-suite property with state-of-the-art facilities, unique dining venues, and lush outdoor landscaping. 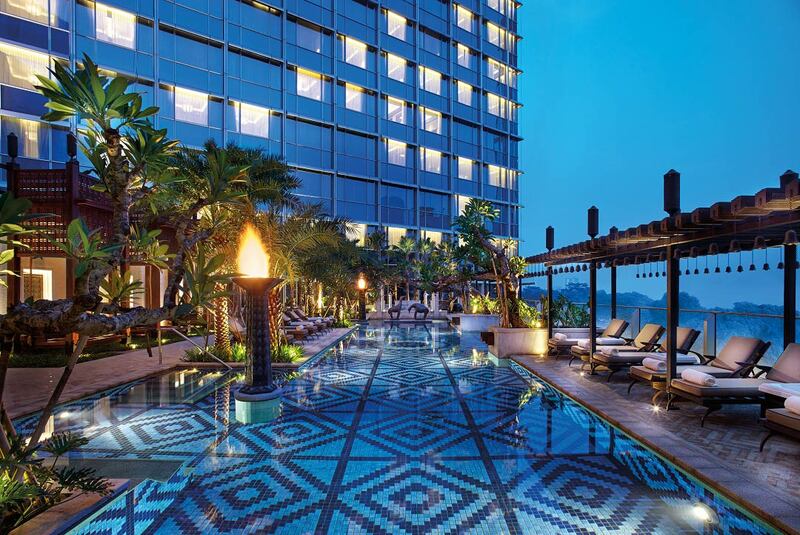 It’s a welcome retreat amid the frenzied pace of the Indonesian capital. 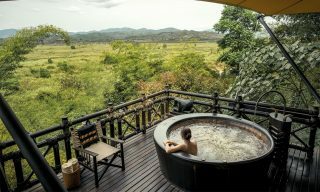 New York–based designer Alexandra Champalimaud has given the hotel a classic feel that alludes to the Indonesia’s past. 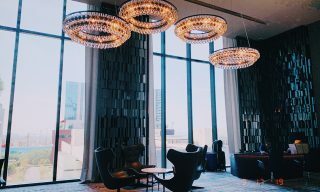 The triple-height lobby evokes the late Dutch colonial era, with luminous chandeliers, ceilings decorated in gold leaf, and streamlined Art Deco moldings. The 1920s-style lamps on the concierge desk are backed by a nostalgic painting of Jakarta’s old town in a fan-shaped frame, while similar street scenes are found elsewhere in the property. Also in the lobby, the grand staircase is flanked by reliefs of clove, nutmeg, pepper, and cinnamon—recalling Jakarta’s history as an important port in the global spice trade. 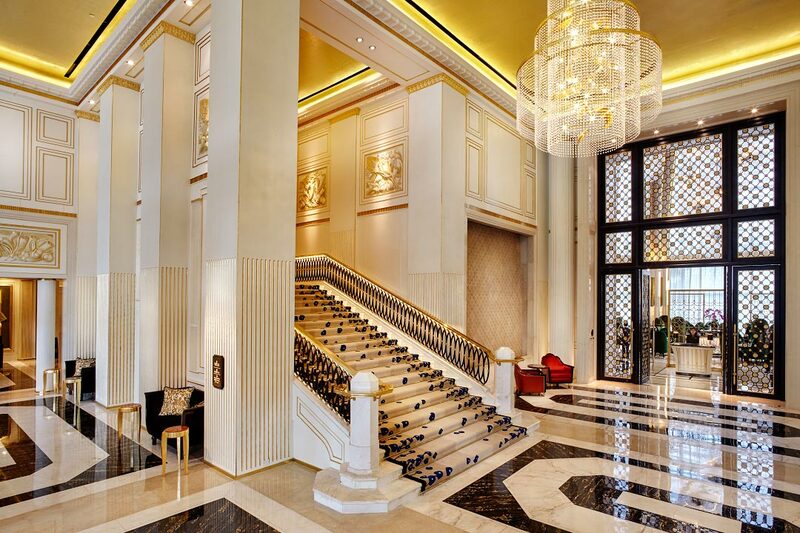 The Four Seasons’ lobby and grand staircase. All 125 suites at the Four Seasons are bright and airy, thanks to a series of wall-to-wall windows and a functional design. The spacious living areas are separated from bedrooms with sliding doors, while chinoiserie wall panels, original Indonesian artwork, and Italian marble bathrooms provide additional glamor. 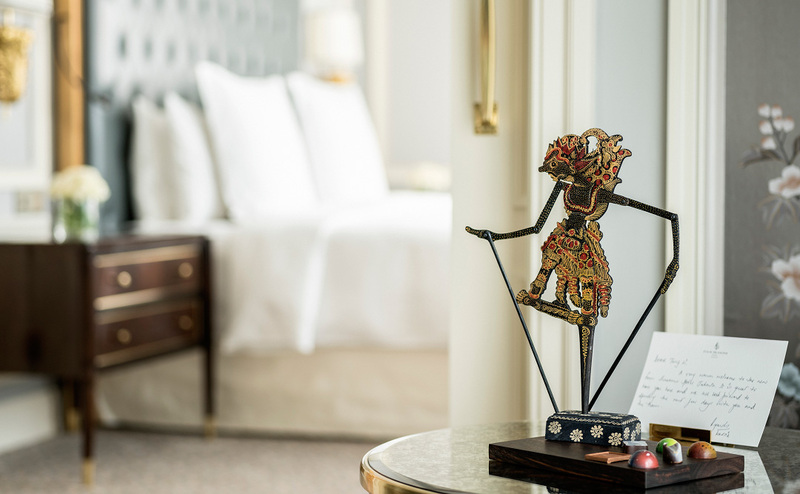 Occupying a prime position on the building’s corners, the Premier suites also come with Javanese wayang puppets and the Four Seasons’ homemade chocolate pralines. Up on the 19th floor, the 330-square-meter Presidential suite stretches the entire length of the building, offering city views from its two bedrooms, living and dining areas, private study, and bathrooms. Javanese wayang inside a Premier suite. After a hectic day exploring the city, guests can find sanctuary in the spa and pool. 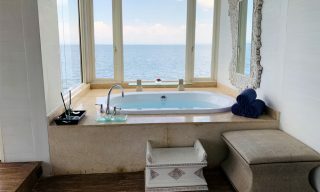 Among the spa’s treatment rooms, Verna is a VIP couple’s suite with an attached bathroom and sauna, not to mention a state-of-the-art whirlpool tub which also releases essential oils. In the relaxation lounge, glowing massage chairs with built-in speakers have been arranged around a central fountain. Painted brass orchids adorn the wall throughout the spa area, while textured areas are reminiscent of bamboo scrolls. The neighboring pool and terrace are equally inviting, with hanging day beds, bespoke pool chaises, and an array of Indonesian sculptures amid the greenery. The resort-style pool area, designed by Bill Bensley. A meal inside the 13-meter-high rotunda at Palm Court, the hotel’s all-day dining venue. The soaring, Art Deco–inspired space is framed by glass walls and columns whose graceful fins suggest both tropical foliage and the age of early aviation. 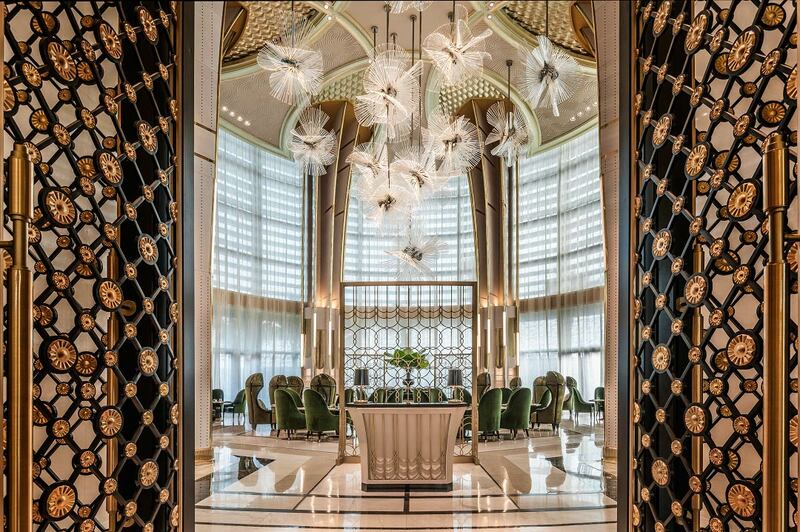 Meanwhile, a magnificent Czech-made chandelier, evoking the fronds of a Bismarck Palm, acts as the venue’s centerpiece. 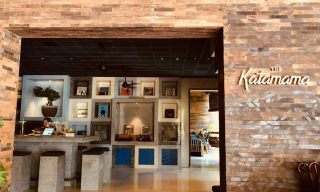 The cross-cultural menu at Palm Court includes a signature Four Seasons Es-Teh (a contemporary take on Indonesian iced tea) and avocado lime hummus, accompanied by a colorful assortment of shaved vegetables and wafter-thin rye croutons. The carnivorously inclined will enjoy grilled U.S. prime beef tenderloin in peppercorn gravy, served with mashed potato and roasted vegetables (not to mention a whole roasted garlic). For dessert, the upside-down mango cheesecake is surely a crowd-pleaser – it’s presented as a dainty bouquet of edible flowers, mixed berries, and delicate chocolate twigs on a bed of “soil” crumble with green-tea sponge for grass.